Within the agricultural economy and the gardening sector mulch foils made of biodegradable material and flower pots made of decomposable bioplastics are predominantly used due to their adjustable lifespan and the fact that these materials do not leave residues in the soil. This helps reduce work and time (and thus cost) as these products can simply be left to decompose, after which they are ploughed in to the soil. Plant pots used for flowering and vegetable plants can be composted along with gardening and kitchen litter. Cost reducing effects can also be seen when using yarns, tapes and clips made of biodegradable material that are used to secure high-growing plantations and citrus plants. Products that have typically/traditionally been used and that are based on conventional materials have to be removed manually after the harvest. This step can be avoided by using biodegradable products that can be composted along with the remains of the plants. Compostable seed belts and active component capsulations made out of bioplastics have also proven to be beneficial. Additionally, biodegradable foils and nets are used for farming/growing mushrooms and the coating of tree and bush-roots. 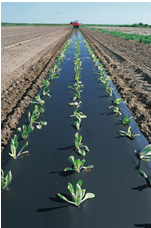 The products that are sold in market-gardens increasingly consist of degradable bioplastics. Foils, yarns and nets made out of bioplastics help to secure freshly created slopes and mounds and protect them from erosion until the roots of the plants have developed sufficiently. In cemeteries, the use of plant baskets and pots made of biologically degradable materials is both convenient and cost-efficient. Operators of golf courses can benefit from the use of bioplastics by using degradable bioplastic tees. This makes the collection of the remaining tees an obsolete practice; the tees simply remain in the ground to decompose.